Hanley Ramirez? Traded. Anibal Sanchez? Traded. Cole Hamels? Signed and taken off the market. Fortunately for those teams still shopping with four days left until the trade deadline, there are plenty of valuable players still out there. You’ll get plenty of analysis of Zack Greinke and other top talent elsewhere. We wanted to cover the second-tier players who could prove to be surprise contributors for contending teams. Here are a few of those bargain-bin trade targets, and the teams best suited to pursue them. The Coors Field Effect is back this year, with the Rockies scoring the second-most runs in the National League despite playing without Troy Tulowitzki for most of the season (Dexter Fowler at home: .337/.434/.620; Dexter Fowler on the road: .258/.317/.409). Yet Scutaro’s been left behind. Though he’s never been a big power hitter, Scutaro’s hitting for less pop than ever before, carrying a career-low Isolated Power (slugging average minus batting average) of .088 as he nears the end at age 36. He’s also walking less often than he has in eight years. Yunel Escobar’s had an even worse year with the bat, and he doesn’t have age as an excuse, being three months shy of his 30th birthday. His youth offers hope for a rebound, though, with Escobar posting a .290/.369/.413 line just a year ago. Worst-case scenario, you’ve got an above-average fielder and base runner, signed at an affordable $5 million a year through 2013, with two $5 million club options thereafter. Either player would be an upgrade over what Oakland has, with Cliff Pennington hitting below the Mendoza list before going on the DL and replacements Eric Sogard (.464 OPS) and Brandon Hicks (.572 OPS) doing very little to help. In a twisted way, carrying replacement-level talent somewhere on the field can be an advantage for contending teams, since it gives them a chance to upgrade without breaking the bank for a star. Scutaro or Escobar would be prime examples of such an upgrade. The Indians sit 3½ out of the second wild-card spot, so you’d have to call them fringe contenders. But acquiring a low-cost player at the deadline could give them a nudge forward without sacrificing any future pieces. Soriano qualifies as that kind of low-cost player, insomuch as the Cubs wouldn’t expect elite prospects in return. He’s not cheap in the literal sense, though, with Soriano’s contract paying him $18 million pro-rated for the rest of this season, then another $18 million in 2013 and again in 2014. 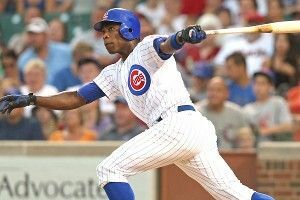 With that kind of money owed to a 36-year-old outfielder with a terrible batting eye, Chicago would surely have to cover a huge chunk of Soriano’s remaining freight to facilitate a deal. If that were to happen, the Indians could benefit from his right-handed power; Soriano’s hit 20 or more homers in each of the past 10 seasons, and is on pace for 31 this year. Johnny Damon’s been somewhat respectable over the past two-plus months (.259/.323/.388 since May 15), but he’s better suited to a reserve role at this stage of his career. Morneau’s another Soriano case, which seems crazy given his history: He is a former MVP and four-time All-Star who last played in the mid-summer classic just two years ago and is still just 31 years old. But recurring battles with concussions and other injuries have severely eaten into Morneau’s productivity, making his $14 million-a-year salary through 2013 look prohibitive. Here again, you could see the Twins picking up some salary for a useful prospect or two. And from the Pirates’ standpoint, upgrading over Casey McGehee (.233/.298/.384) wouldn’t seem too difficult. If anything, Morneau and McGehee could form a potent platoon: McGehee’s hitting .267/.364/.493 versus lefties, while Morneau’s pasting right-handers at a .306/.378/.548 rate. Bryan LaHair brings no such salary burdens, making league minimum and not even eligible for arbitration at year’s end, let alone free agency. But he’s also a less reliable commodity than even a diminished Morneau. LaHair went completely bananas in the first few weeks of the season, racking up a sky-high 1.279 OPS through May 7 and riding that massive start all the way to an unlikely All-Star appearance. He’s been punchless ever since, hitting just .224/.290/.339. Still, as a potential platoon partner for McGehee, the Bucs could do worse. The Giants are known to be pursuing bullpen help, with no truly reliable right-hander in the pen other than Sergio Romo: Santiago Casilla’s bagged 24 saves, but he’s blown six with six homers allowed in 37 innings, and George Kontos has been very good, but he’s tossed just 18 innings for the Giants and 24 in his big league career. Indians closer Chris Perez has come up in trade rumors, but the Indians are still stuck in maybe-buyers, maybe-sellers purgatory. Broxton offers a cheap alternative. The Royals are motivated to move him, having signed him to a highly flippable one-year, $4 million contract in the first place. Broxton’s striking out just 6.3 batters per nine innings, miles from his career average of 11-plus per nine. But he’s become a near-extreme ground ball pitcher at this stage of his career, posting a career-high 56.6 percent ground ball rate that’s helped limit opposing hitters to just seven extra-base hits in 132 at-bats. No top prospects would need to be moved to land him, and Broxton could provide needed depth for a pen that could well still be working deep into October.